Oak Beach Forecast & Tides, and a little self-indulgent pre-IDW moaning. TO 20 KT IN THE AFTERNOON. SEAS 3 TO 5 FT.
NW WINDS 10 TO 15 KT. SEAS 2 TO 4 FT.
NW WINDS 5 TO 10 KT...BECOMING S. SEAS 2 TO 3 FT.
Tides for Oakbeach starting with April 29, 2011. I am feeling a little stressed out/depressed about the class, though. All of my Facebook friends know the situation because I've been whining about it on a regular basis over there. Basically, late Winter/early Spring is budget season at work. The last time Sebago did an IDW, I couldn't do it because it overlapped with the presentation prep time. This time, the timing was actually perfect - our presentation was on the 14th, I think it was, we had the week before slated for building the deck, and then there were going to be 2 weeks where things were back to normal and I was going to have evenings free to prepare. Well, that all changed, the presentation is today, there have been intense 12-hour days for all and I am just mentally wiped out. I do mostly have my stuff together. I've been paddling all winter & so my kit is all reasonably well organized in little bags that pack in a big bag & then transfer to my day hatch. I was able to make it to West Marine yesterday for a few sundries that TQ & I needed or wanted. OH MY GOSH! I just went to West Marine and I spent SEVENTY DOLLARS! Can you BELIEVE I spent that much money in ONE TRIP??? I'd left a key item at the club (lightweight hood with noseclip) when I did my big Spring boat cleaning on Sunday. Fortunately it was found by a clubmate who left it in the clubhouse for me, but that was an important enough for cold-water immersion work that I would run over to New York Kayak today to get one (Randy had told me he had the right ones in stock) if I hadn't had mine in hand by last night, but TQ was my knight in shining Taurus and ran me out to the club to pick it up. There are a couple more items that the EMS (Eastern Mountain Supply) store across the street should be able to cover for me. But man, I'm just rattled right now, and very nervous about jumping from the mental intensity of preparing the budget to the physical and mental intensity of the first 3 days of this 6-day process without one single day to sort of catch up with myself. I do have hopes of an early "pau hana time" today - 3-ish would be awesome but I really, really wish there were 48 hours between the start of the budget presentation and the start of the class, instead of 24. I'll do my best, but...phew. Does anyone know of a store I could go to to buy the proper frame of mind? and he's trying to do something to help the ones at the South Street Seaport. Ode To The Tuna Tower That Stands Between My Friend Dan's Trimaran Pretty Gee And The Launch Ramp. Don't make Daniel use a hatchet! My Earth Day wish for my personal little 4x6 plot of earth was granted. The sprouts they are a-sprouting (the chard is not pictured since it basically looks exactly like the beets right now), and my daffodils are just about at their peak, and we had a gorgeous, sunny, warm day to enjoy them. More signs that spring really is sprung: This weekend I saw the first jellyfish, the first black skimmers, and the first gnats of the the season. It was a good kayaking weekend -- first time since Cape Cod that I've been in my boat 2 days in a row. Yesterday, TQ & I ran up to CT for an early Easter dinner with his folks & one of his sisters; we worked up a good appetite with a 12-mile paddle from The Small Boat Shop in Norwalk to the Fish Islands and back. The forecast had been incredibly unpromising, looking like conditions for another fine Torture Paddle (15 - 20 knot rains and 100% chance of rain all day), and we were meeting a friend there, and both parties had been expecting the other to cancel, and if either had, the other would have too, but it all worked out great - it was absolutely pouring when we left TQ's apartment, we got drenched walking to his car and more drenched loading boats (actually yesterday was the Sebago Season Opener, and when we got there at 10, which I think was the official start time, only sailing co-chairs Jim & Holly were there setting up for the Laser race technique class that was also happening - I really wonder if anybody actually paddled at the Season Opener). We drove up in the rain, we launched in the rain, but it's not rain that makes a Torture Paddle (once you're in a drysuit, that doesn't matter), it's wind, and the promised 15-20 kt wind never materialized. There was a light breeze when we set out; the rain let up & then stopped pretty quickly & over the course of the afternoon, even the light breeze stopped & the water settled down to glass. I wish I had some pictures, it was sort of an atmospheric, foggy day, there were ospreys everywhere, we crossed paths with a lovely J-100 that was still somehow moving along despite the light air, and we paddled a section of the coastline I hadn't done before (when in Norwalk we usually do the Norwalk Islands but I asked for something different this time), and oh, there were loons everywhere, I don't think I've ever seen so many loons on one paddle, but the memory chip for the Optio was in a pocket on shore. This morning, we met a friend at the club for some pre-IDW (Instructor Development Workshop, the Amerincan Canoe Association's 6-day kayak instructor certification process) practice - it was great, a quite necessary bit of preparation, we just went out in the bay & spent a couple of hours practicing rescues & towing. We went through most of basics - eskimo bow rescue, T-rescue, cowboy self-rescue, Hand of God, and the Scoop, a little rolling, a basic single tow, an inline tow, and a fan tow. It was lots of fun, I feel much better prepared for the workshop having done a little more preparatory practice (I've been reading & watching videos but nothing beats doing), and we really picked the right days for our activities - yesterday was gray & chilly and a good day to do a long paddle; today it was 70 degrees and although the water is still quite biting, with drysuits and a light layer of fleece on we were perfectly comfortable for the 2 hours or so that we spent falling in the water. I had a thermos along but we never felt the least need for anything hot to drink. Can't believe the IDW starts on Friday. 4 more days of budget hell, too, yuck -- when I originally signed up for the IDW, the FY12 budget presentation was in early April. It got moved to this coming Thursday. Not sure I would've signed up for the IDW if the presentation had been originally scheduled for the day before the workshop, but I couldn't quite bring myself to use that as an excuse to back out of something to which I'd already committed. Wish me luck. PS - how do you like the new look? It was the bigger picture option that FINALLY made me abandon my old original Blogger template, which I'd always sort of liked. I tried to stick a picture in the back a la Tillerman (love today's post btw...) but it didn't line up the way I thought it was going to & I finally threw in the towel & stuck with a nice plain blue, rationalizing the decision by saying to myself that that would work better since I tend to do pictures all the time anyways. Might mess around with it some more once we're done with the budget but for now - well, I hope you don't hate it 'cause it's kind of a done deal now. I just can't wait to see the garden this weekend. We have had 2 weeks of perfect beet, chard, and pea-sprouting weather since I planted. Had we gone to the club last weekend, I would've tried to manage my expectations - but with 14 days and many, many April showers since planting, I've got my fingers crossed that things might be popping up. Oh boy. And as long as I am tossing up an Earth Day post, this seems like a good time to share a fun link that's been running around my Facebook friends - National Geographic's Top 10 Urban Escapes. Great stuff - and look who's #1! Woohoo! Tallship Soren Larsen ocean sailing in a gale between Easter Island and Pitcairn, making 9 knots in great ocean sailing conditions. Filmed by Poul Sodeman. See www.sorenlarsen.co.nz for more info. Just had to share another one of Vlad's marine-mammal encounter shots. This just cracks me up as the quintessential seal-watching shot - they always seem curious about us, but they do like to be the watchers, not the watch-ees! Although Vlad said they were being pretty sociable that day & he got some enviable shots. From Vlad's Staten Island Circumnavigation album. The most recent WaterWire features an excellent article about the goings-on (or lack thereof, more like) at the South Street Seaport. 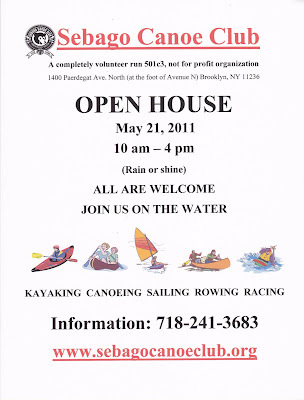 I'd mentioned on Facebook the other day that if it was time to publicize the Sebago Open House, it was also about time to rebuild my Ways to Get On The Water blogroll (I've been slowly rebuilding those ever since Google blacklisted the old Blogrolling.com service I used to use), which had been based on my "24 Ways to Get On the Water post" (now linked in the blogrolls as the single item "Float Plans!"). 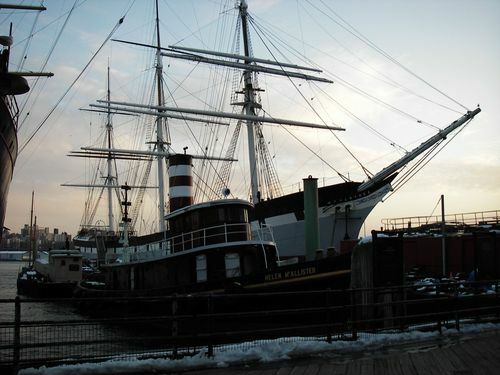 I'd mentioned that #16 made me sad because the fate of the Seaport fleet was so up-in-the-air - this article addresses the situation quite well and gives a couple of links to sites where the public will be able to follow what's going on. Oh - the photo above? I have got to link to the original posting - that was taken on a day when things didn't go according to plan - and what happened instead was wonderful. My goodness, summer must be on the way. 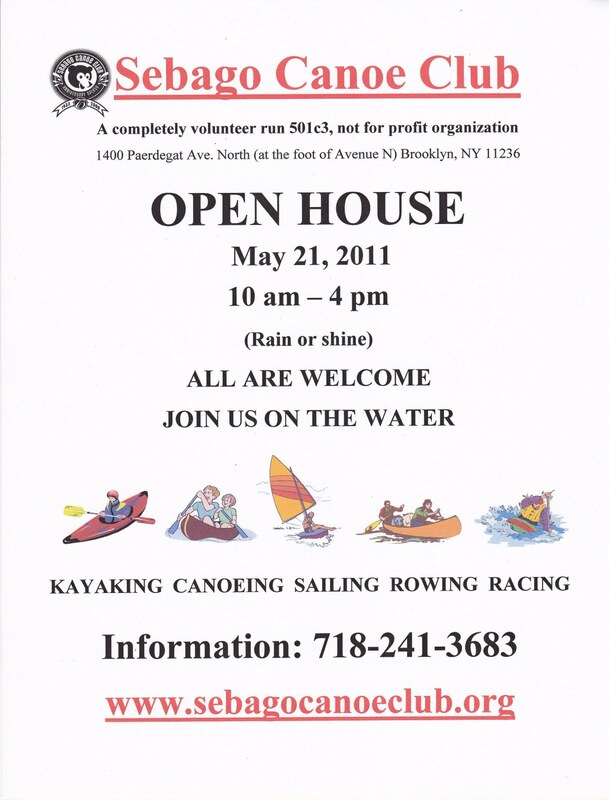 To give you a live link: for more details, visit SebagoCanoeClub.org, and to see the kind of fun to be had at the Sebago Open House, click here! And...HEY LASER SAILORS! Don't forget, Sebago's annual Spring Laser District 8 Regatta is coming up SOON! Boy, May seemed so far away when I first posted about that. because apparently chickens are in. Goody goody. 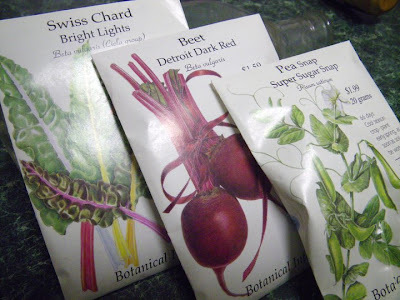 Let the gardening begin! Thanks to "umiak defenestration director" (the tall guy!) Rob Buchanan for sending this out to the local paddler email lists. Loved it, gotta share it! Oh, and remember the plate-lunch video I shared a couple of weeks ago? I finally got curious enough about who made the fantastic plate-lunch illustrations that I left a comment on the video - got an answer right away, her name is Amorette Dye and here's her Flickr gallery of some of her best bento box creations! 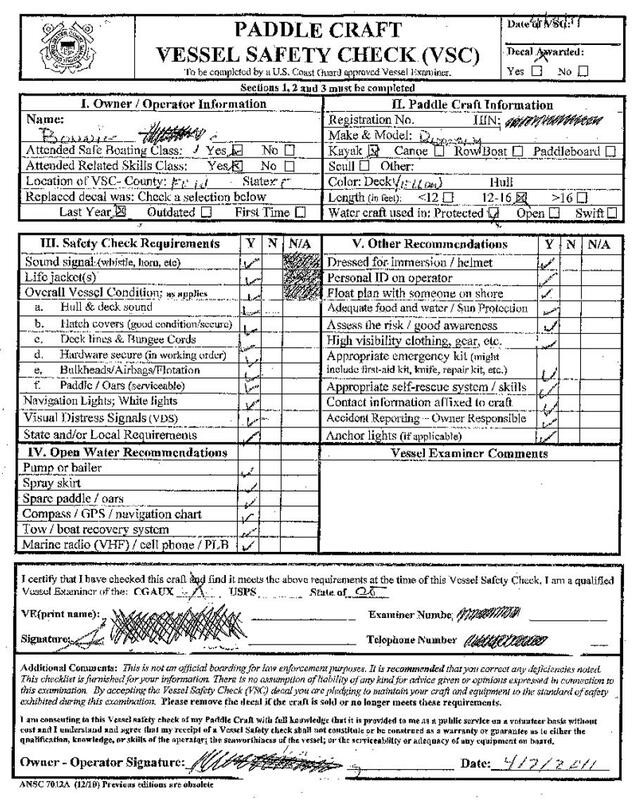 Introducing the Relatively New (And Entirely Excellent) Paddlecraft-Specific Vessel Safety Check Form! Well, as I announced on Saturday, I passed my Vessel Safety Check during the very good day of paddlecraft safety programming run by USCGAux Flotilla 72 up in Norwalk, and was particularly happy about it because this was the first time I ever just did it on a whim - I usually have it done at Sebago during one of the events where the CGAux folks from the neighboring yacht club come by for the purpose; it doesn't take a lot to pass, but I'm still obsessive enough about such things that I've usually done my own preliminary exam well in advance of the scheduled day. I knew they were offering VSC's on Saturday, but hadn't been thinking we would take our boats up for the workshop - we would usually borrow Small Boat Shop boats for something like this. We had to stop by the club to pick up our paddles & sprayskirts & stuff & since this time the workshop wasn't actually at the shop, we decided to save ourselves a stop by taking our boats, too, so there I was with my boat & my kit & a friendly Coast Guard Auxiliary examiner offering to do my VSC. Hadn't prepped for it at all (well, I did sneak a peek at the expiration date on my flares) so that was sort of a fun little first, as I mentioned. But it just hit me today that there was another first involved that's maybe more worth sharing! I realized that when I looked at my form. I'd stuck it in my jacket pocket so had it at work, and I pulled it out to look at it just to kill time while I was waiting for a report to download. 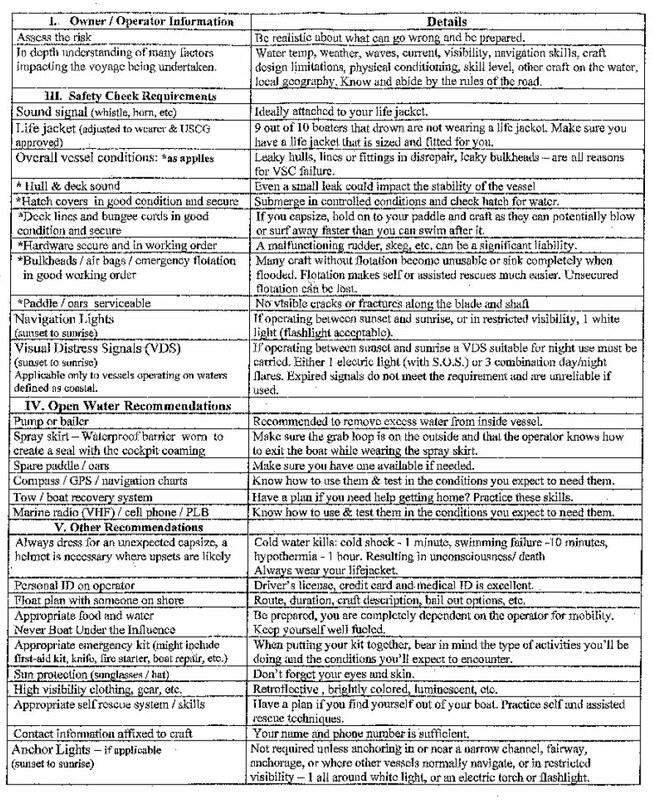 People are always curious about just what an inspector looks for when inspecting something as simple as a kayak or a rowboat. I'd sort of answered, but the questions people had asked in response to the post got me just curious enough to pull out the form for a quick look-see. And - duh! - that was the first time that it actually sank in that the form they were using was totally new, and a serious improvement over how it used to be done! Examiners used to used the same form for kayaks, canoes, rowboats and other small unmotorized craft as they would use for larger vessels. 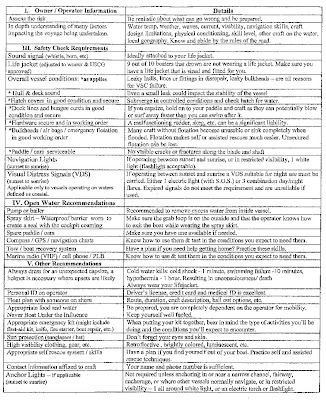 It could be confusing for a less experienced examiner -- the young man who did my boat last year was learning under the observation of the examiners who've been inspecting Sebago's boats for years, and he did ask about a fire extinguisher - it wasn't a stupid question, either, it's there on the "Requirements" list and it's not entirely as obviously "N/A" as "marine sanitation device", "ventilation", "backfire flame control" and some of the other items that are clearly only applicable on larger vessels. 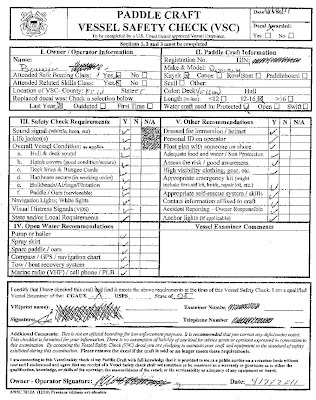 More importantly, though - that form gave you all the nifty extras that an examiner likes to see on a big boat, so if you owned a large boat, you walked away from your examination with a nice printed list of things you could easily add to improve the safety of your craft. A paddler or rower, on the other hand, walked away with a sheet of suggestions of which a few were definitely useful (marine radios, boating safety classes, first aid, and float plans are pretty much universally good ideas), some that didn't apply - and with no mention of a whole lot of practices and preparations that many experienced paddlers would consider to be almost as necessary to paddling safety as a life jacket. The new form really kind of ROCKS. It's really excellent, and boy, I could blither on, but why should I when I want to go home and I can just let Form ANSC 7012A (12/10) speak for itself? Click & zoom for detail. 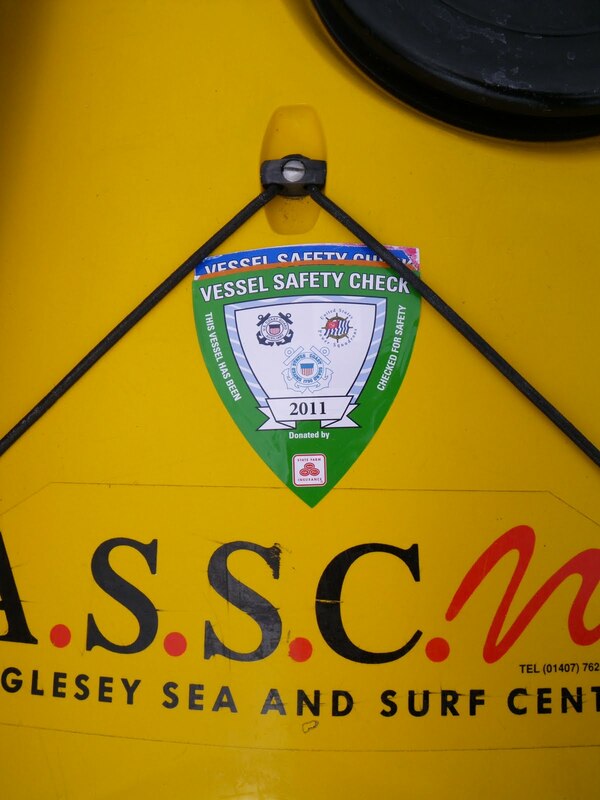 Passed my Vessel Safety Check for 2011 today. Sort of fun since this time I wasn't really planning on being inspected, but they were doing checks at the cold-water thing, and I had all my stuff, so I figured I'd let 'em look. Yay! For more information on the US Coast Guard Auxiliary's complimentary Vessel Safety Check program, click here.